I love gnocchi. 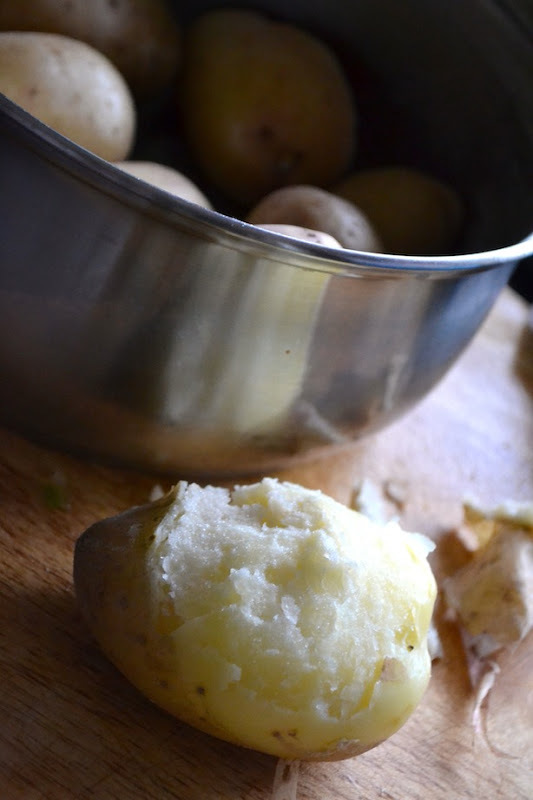 And it's always one of those things I never thought of making at home, until I discovered I had a bag of King Edward potatoes that needed using up (you can't get through 2kg of roast potatoes in a week - well I can't anyway). 1. Boil 1kg of unpeeled floury potatoes in water until just tender. Depending on the size of your spuds, this might take about 25 minutes. When they're cooked, drain them and leave to cool a bit, before slipping off their skins and transferring to a bowl. 2. 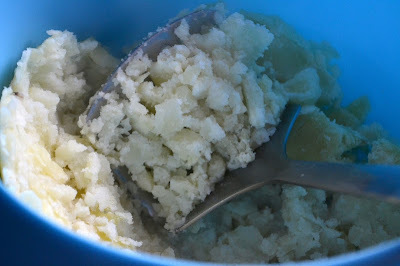 Mash the peeled potatoes (don't add any milk or butter or anything else, just mash the dry potatoes). 4. 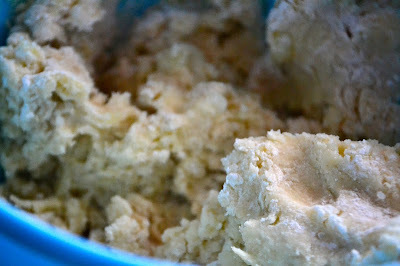 Take a handful of the dough and roll it out to form a sausage shape - if it starts to break up, just apply a bit more pressure - it will turn smooth on rolling out. Then, cut pieces off with a sharp knife. 5. 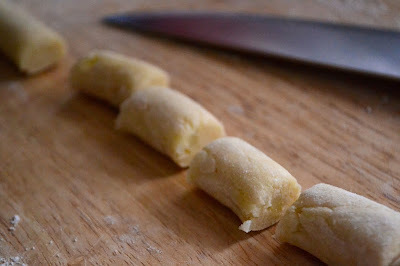 Press the prongs of a fork into the gnocchi and roll, or just press the fork in on both sides. This will help the sauce cling to the gnocchi so it has somewhere to go (in the grooves). 6. Drop the gnocchi carefully into boiling salted water and simmer for about 2 minutes - you'll know they're cooked when they rise up to the top of the pan. Then, scoop them out with a slotted spoon, drain off the excess water and then lower them into a pan of tomato sauce, to keep them warm until you serve. Depending on the amount you make and the size of your saucepan you will probably have to make them in two batches. Don't, whatever you do, grab them in your hands - they will clump together and be difficult to separate. Pick each one up and drop them into the water individually. If you have gnocchis sitting around and waiting for the pan, keep them apart from one another (on one layer) on a lightly floured board. 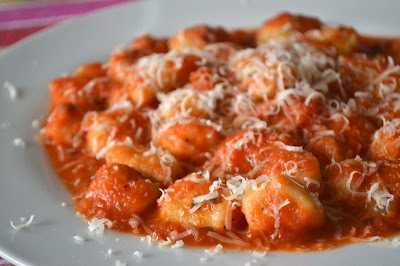 The finished gnocchi, in tomato sauce sprinkled with grated Grana Padano.... lovely! Have you ever made gnocchi? How did you get on with it? How do you like to serve gnocchi? This is great! Thanks so much for sharing this. I find that shop-bought gnocchi is too salty and dry for my liking. Hence I avoid using it at home and order it in restaurants I am confident will make it in-house. 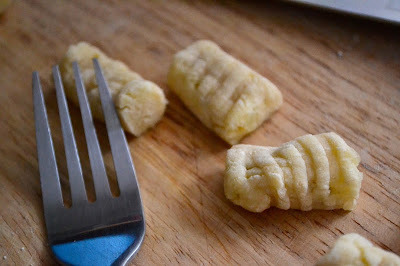 Gnocchi should be glorious - potato joy at its best - so thanks for making it achievable at home! Your gnocchi looks wonderful. I sometimes sneakily boil more potatoes than we necessarily need so I can make gnocchi the next day. I normally just toss it in browned butter with sage, simple and delicious.